Next post: So she’s pissed. This is one of those happy instances of the law of unintended writing consequences. A friend just told me that my dad, Murray Morgan, is a minor character (or a referenced person) person in Though Not Dead. Very cool. He was indeed in the ASC in the Aleutians at the same time as Dashiell Hammett. I look forward to reading the book and wish Murray were still around to see the reference. 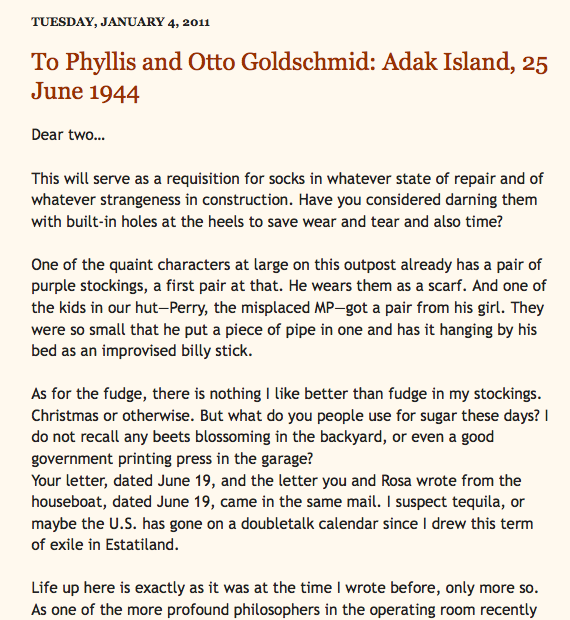 It turns out Morgan wrote long letters home from the Aleutians and Lane has been posting them on line here. Richard Wright was not the type of man usually involved in conspiracy. A Liverpool merchant, prosperous and proud of his family, he had a burgher’s respect for safety and six per cent. Charles Francis Adams, the American Minister to Great Britain, was more a precision instrument than a human being. A brilliant, polished New Englander, the son and grandson of presidents, compressed to the hardness of a diamond by the accumulated weight of family tradition, he served as the cutting edge of American diplomacy. Waddell was startled by the dissension. A romantic, a believer in the glory of war, he could not understand men who were untempted by adventure. There are many more similarly wonderful prose portraits, especially of Waddell and his crew, who are parfit, gentil knyghts without sacrificing any attention to their mission, which they fulfill to admiration while murdering no man nor outraging any woman. One of my favorite stories is the whaler which is under the command of the captain’s wife, the captain having died on the voyage. She has preserved his body in a barrel of whiskey so she can take him home and bury him in the family plot. Waddell sinks her ship, but he sees the lady and her pickled husband both landed safely on shore afterward. Marvelous stuff. Due to what I’m beginning to believe is the almost suicidal shortsightedness of American publishing, Morgan’s book is no longer in print, but fear not because there are used copies galore available on Bookfinder.com. This is the best book written on this subject, and it is well worth the extra effort to acquire. Accept no substitute. I have read and enjoyed all of your Kate Shugak series but was upset by the number of editing errors in “Though Not Dead” eg pg 288 …”she didn’t notice the tail for almost six months.” Surely not months… There just seemed to be a large number of grammatical and spelling errors, more than in the past. Try blocks. I know, I’ve heard, and I apologize. I just finished Though Not Dead and loved it! However, there were a great many errors your editor should have caught. In the family tree, you have Chief Lev marry Victoria, when on page one, her name is Alexandra. When Ruthe is talking to Kate, she refers to Chief Lev’s wife and daughter by Ekaterina. I also noticed the “months” error and when Demetri is pulling Kate’s pick-up out of the snow, he uses his parking “break” not “brake.” Also, you have Jim flying at various points into San Jose, Los Angeles, Long Beach and Orange County. Finally, doesn’t Kate get bashed about one too many times here? How many times can she be oblivious to someone sneaking up on her? But, I have to tell you, I loved the story and the history and I’ve already tried to reserve a copy of Castner’s Cutthroats at the library. Finally, I take your book recommendations to heart and Tony Horwitz’ Blue Latitudes was my favorite book that year! Thanks! Thanks, Marcy. I’ve passed your comments about the errors along to my editor. It’s exciting to hear from you; thank you for such an immediate response. I’d like to weigh in on the sexcapades; more, please! I must confess, sometimes I even read ahead to catch Jim & Kate in the act! What a great resource Bookfinder.com is. Wow I could stay they for days just looking at all the cool stuff there. If you just type in Queen in 3-D, a cool stereo photo book, by Brian May, all sorts of English things come up. Even articles by the Duke of Marlborough. Also, I am nearly done researching Blood Will Tell and Kate hasn’t been hit on the head even once yet. During the Civil War a Southern author wrote a series of novels. He tried to mirror current events. The heros were always pure gentlemen killing off the mongrel hoards of the Union. I never heard of these novels, Grant, thanks for sharing. Huh. 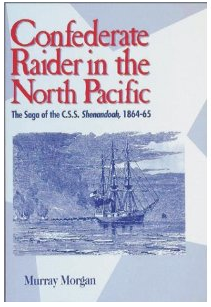 I was in some danger of getting a posting to Adak in my Navy years. A near miss. Went to Guam instead…. Less than perfect as a novel, but his thesis is gripping: What if the Manhattan Project had yielded a working bomb a year earlier, in 1944, and had helped to shorten the war in Europe? Since Hitler and Co. were killing something like a million people a month in the last year of the European war…. ObSF: “A History of the Twentieth Century, with Illustrations”. For a day when your will-to-live is too strong…. Not a story for midwinter Alaska! “Most of the U-235 for the first uranium bomb was separated by Ernest Lawrence’s “Calutron”, using industrial-scale mass-spectroscopy …” The mind boggles. This ex-chemist’s mind, anyway. Some of this stuff was still in service when my Dad spent a sabbatical year in Oak Ridge, circa 1958. Somewhere I have a neutron-activated silver dime, a souvenir of a tour there…. First time I saw Waldos in action!